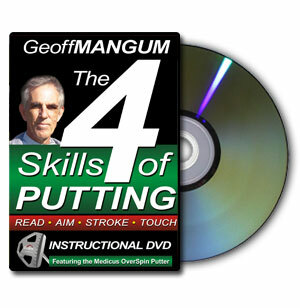 Filmed at the beautiful Fox River golf course, Putting Guru Geoff Mangum presents, in full, the 4 Skills of Putting. With the help of the Medicus OverSpin Putter, Geoff Mangum gives an in-depth explanation and demonstration of Touch, Stroke, Reading, and Aiming, and everything in between. His unique approach to the game of golf will transform your performance and attitude and bring your game to a whole new level. Read the putt for target. Aim straight at target "hole" on fall-line. Putt straight where the putter face aims. Putt with the usual tempo and touch.